That last item never really gets crossed off either, it recycles daily and is really only there to remind me that it is the most important item on any list (except the cats food and litter, she gets cranky). I like lists and I like tracking my progress and crossing things off. I have notebooks dedicated to my lists where items from yesterday can be brought to the next page and you can see the progress (or not) of my industriousness like layers in sedimentary rock. I have such a poor memory that I couldn’t really function without them. They keep me on track. Sometimes though, I use my lists to procrastinate. I especially use that first list to procrastinate on the second. Which is crazy right? I look at that second list and there is not one thing listed which fails to get me excited. Just sometimes the steps are a little too large and I get daunted or more often I get everything ready and then my self-doubt kicks in. So I wander off and do something else and if that something lets me cross something else off of a list, any list, then I get to feel like I’ve accomplished something. It’s not the same high I would get from a submission-ready final draft of that flash fiction but it’s easier than facing all that fear and self-doubt. In my defense I usually come back to the second list and get some work done but I’m certainly less productive artistically than I could be. Than I SHOULD be. Today I procrastinated by making what I thought would be a time intensive fancy dinner that turned out to be quick easy and delicious. I was done and fed in no time and got a lot of little things crossed off my creative to do list. So to celebrate that quick return to my word processor I’d like to share another author recipe. Steps involving bacon and mushrooms may be omitted. Saute chopped leaks and potatoes in a large saucepan (mine is 12 inches with high sides) for several minutes. Until it is nicely aromatic. Once the smell of leeks and butter are making your mouth water add the broth, salt and pepper, and optional bacon. While simmering broth sauté mushrooms in butter until they develop a nice colour. Do not crowd. Remove both broth and mushrooms from heat and allow to cool. Add cream and half of mushrooms to broth and mix. Serve cold or reheat in pan. Garnish with chives and mushroom. 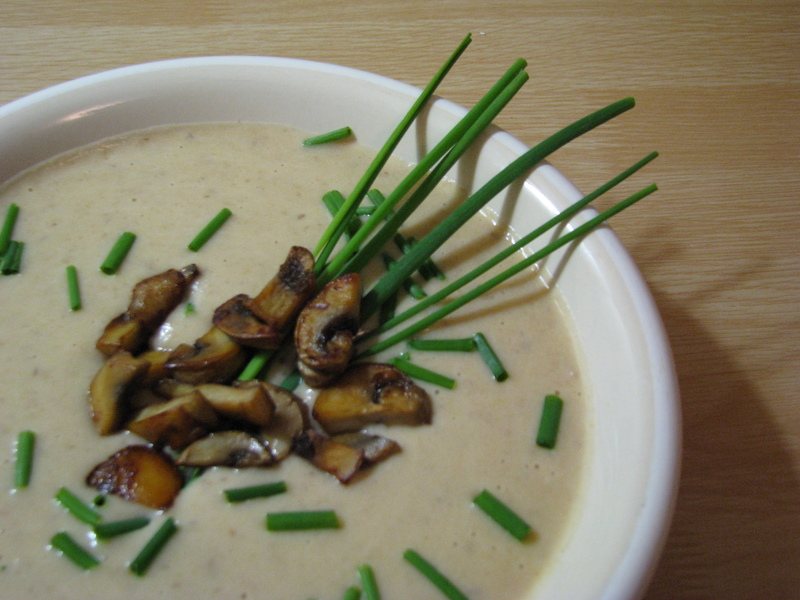 Don’t forget to reheat the garnish mushroom if serving the soup hot. Keep in mind if you use bacon bits they might be made with dye to achieve their bright colour. You could see this as a disaster or pretend to be Bridget Jones and serve pink soup! Omitting the mushrooms and bacon I think this would be a highly adaptable recipe. I intend to try several variations. Add citrus and fruit with the broth (veggie), lemon and cranberries perhaps. Nothing too sweet, it should be light and summary. This could turn out horribly wrong. Either way you’ll probably hear about it. Walnuts and almonds, blended into a paste and then blended into the soup. Definitely served cold. It would be so rich and decadent! Stir in some cooked wild rice to the finished basic recipe to add flavour and texture to the creamy soup.